Big Jo’s Bacon Cheese Burger is an exquisite hamburger. The burger flourishes through a well taken care burger taste balance; one that begins with an an alluringly beguiling impression environed by a sapid aroma that is eventually encumbered by a gentle misalignment of its burger construction, a slight unattractiveness that is not made apparent until one intimately makes a connection with this californian burger. The moment this hamburger is handled from its stay a release of tasty extracts are splashed, juices that are carried onto the first bite of this burger fill one’s mouth with a good first impression. In that mouthful, if it wasn’t visually noticeable, it is made palatable that the bun will be the most ostentatious of the ingredients. Good, cushy and round, the bun is also boastingly arched in an oversized lurid sense of vanity; a sense that eventually compresses onto itself to make appear as if only a lonely bun existed on that plate. Fortunately, this vanity is not lost on the specks of sesame seeds that bring minute explosions of a deliciously enjoyable subtle nuttiness to the burger taste balance. The patty has a pleasantly packed rotundness that is accompanied by a sound beef taste and an inviting inner pink; what the meat lacks, as one discovers through various more domineering ingredients, is girth – the thickness to lead the burger further ahead, too not leave one with the feeling of having a vegetable governed sandwich. The veggies, the finely chopped lettuce and onion and a portion of tomato sliced with finesse, all demonstrate fresh and tasteful prudence as they convolute with a sweet sourly biting sauce that mixes well with the burger taste balance. The yellow gluey silkiness of the cheese translates as a mild suggestion that is easily forgotten, not alike the bacon, that even with a few rubberlike streaks, bids a hardy roseate redness with a lush bacon saltness that is lasting. The fries are as good as apparent frozen fries can be. 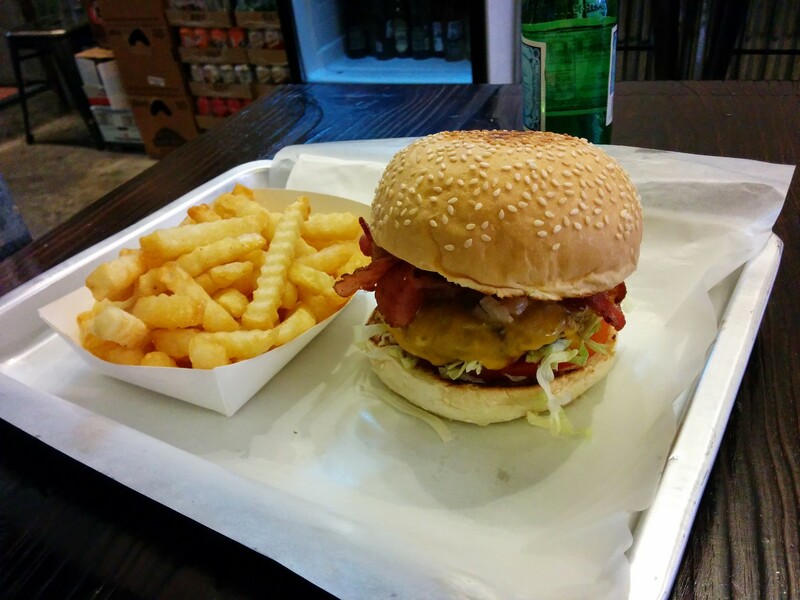 For 80.00 HKD plus an additional 20.00 HKD for the combo, Big Jo’s has a burger with a relaxed enjoyable satisfaction. Some of the hamburger’s more voluptuous burger construction proportions might hinder the burger’s burger taste balance to a slight… But in a neighborhood with two very strong contenders around the corner, this Californian manages to set itself apart and ride that exquisite burger wave.